A thought-provoking movie has the ability to shift our perspective and inspire us to make changes in our lives that we otherwise may not have made. While some movies only scratch the surface of our psyche, others go straight to the soul and encourage and empower us to integrate the teachings or messages into our daily lives. By being engaged and fully present while watching a movie, you can absorb the underlying message to further open your heart and mind. 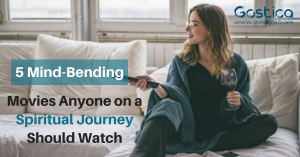 Dr. Wayne Dyer has influenced millions with his spiritual teachings, and in this movie, he highlights why and how to make the shift from ambition to meaning. He also uses the metaphor of moving from the morning to the afternoon of your life – introduced by the psychologist Carl Jung – which is where everything is driven by purpose. The ‘morning of our lives’ is ego-driven, whereas the afternoon and evening are where we experience the meaning behind interactions and a sense of purpose about our being. The Shift is perfect for anyone looking for spiritual inspiration. This film will motivate, inspire, and certainly impart a massive and positive shift in your perspective. This movie is free on YouTube. Watch it here. The greatest secret of the universe, and the only one we need to manifest what we want is the Law of Attraction. This popular movie features interviews with scientists, philosophers and leading authors who have all used The Law of Attraction in their own lives to manifest their intentions. The Secret is a great film for those just starting out on their spiritual journey or those who are interested in learning more about the Law of Attraction and manifestation. Based on the best selling book by the same name, this storyline will rock your world!! Jon is drawn to Peru by a series of synchronistic events, and once he arrives, he discovers the ancient laws of the universe . . . and learns how to activate them in his life. This movie feels like a continuation of The Secret and through story form, explains the concepts of synchronicity and synchronistic experiences along with the fact that there is something much larger than us at play. And once we tap into this knowledge, we can create a reality based on our desires. Along the spiritual path, we understand the importance of moving from the mind into the body, and this movie highlights how yoga is not just an exercise for the body – but one of the mind and spirit as well. Awake follows the life of an infamous yoga guru named Yogananda, who brought yoga and meditation to the West in the 1920’s. This award-winning documentary features interviews with people who have been influenced by the teachings of Yogananda, such as Deepak Chopra, and highlights his transformational impact on the Western world. To learn more about Yogananda’s incredible journey and influence on the yoga world, we highly recommend reading his book Autobiography of a Yogi. This is a movie that has provoked thought for almost two decades since its release, and still remains a groundbreaking film on the concept of reality and our perception of it. Whilst on the spiritual path we will question many of the day-to-day things we experience. The Matrix expands on that questioning by asking us what we would do if we found out the reality we know was all artificial. “You are in a prison that you cannot smell, see or touch, it is a prison of the mind.” This quote from the movie invites us to question what mental limitations we have imposed on ourselves. The Matrix is a must-see if you haven’t already, and it’s a classic to rewatch if you have seen it. Either way, get ready for a total mind-blow that will change the way you view . . . everything. Walking the spiritual path involves the liberation of the mind from old ways of thinking and encourages the forming of new beliefs and habits that serve our highest potential. These movies can act as a springboard to asking ourselves the right questions to start the process of personal growth and evolution. Throughout your spiritual journey, it’s important to remember that it is a continual quest for knowledge and that this knowledge can sometimes be found in the perception others have of the world.